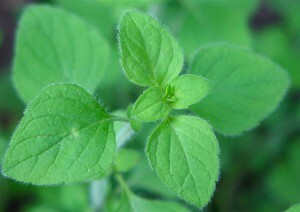 The fragrant leaves of nepitella look very similar to oregano. When I cook, I like to think about music. I often have music playing (and a glass of wine poured) but I’m not talking now about the music I’m listening to. Instead I like to think about bass notes and treble notes or low notes and high notes. Different flavors elicit different types of notes. Example: salt would be a high note and black pepper would be a low note or bass note. When cooking a red sauce, I often strive to have the flavors balanced between high and low. And adding dried oregano pushes the sauce into the high-note territory and adding dried basil takes it down into the bass category. 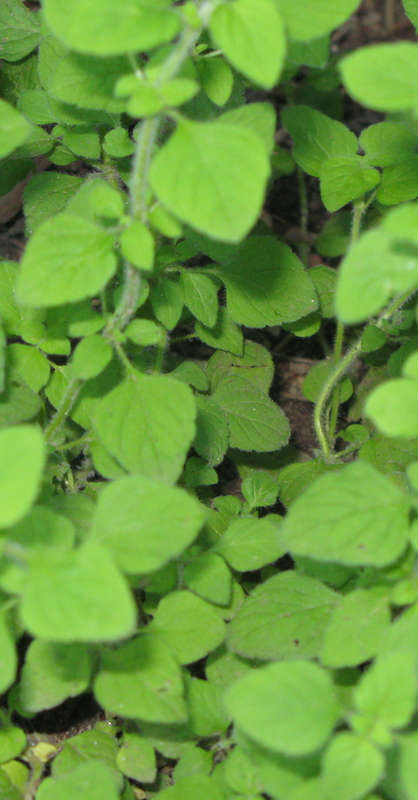 Nepitella is definitely in the mint family. It has that high note of mint flavor but with a bass note added; not another high note. Therefore I believe nepitella is more like a combination of both basil and mint. But really, it’s in a class all its own. The plants grow wild and come back year after year. When Should You Use Nepitella? So what do I use it for? There are really only two things I use this herb for: mushrooms and artichokes. Whenever I use mushrooms or artichokes in a recipe, I sprinkle fresh (or in the winter, dried) nepitella on them and then add them to the recipe. It is a perfect compliment. Where Can You Get Nepitella? My grandmother brought nepitella seeds back with her from Italy many years ago. She planted them in her garden in Boston and a few years later, nepitella was growing everywhere: in the cracks in the asphalt in her driveway and up against her house as well as in the cracks in the sidewalk around her house. It is a hearty herb and a pleasant one. What it does is re-seed itself. The green leaves sprout light purple flowers that turn to seed and drop in the ground nearby. And in that way, it spreads itself. I took a few plants from the cracks in her driveway and planted them in my backyard. And now this delightful herb grows wild around my home: just waiting for me to come pluck a handful whenever I’m cooking fried mushrooms or stuffed artichokes. Surprisingly, nepitella is getting more popular in the States. A search on Google turned up a few articles and places on where you can order it online. Gourmet Magazine even featured a video on its site last year with an Italian chef explaining “why you’ve got to get this wild Italian herb into your kitchen.” But then he goes ahead and adds it to fried crabmeat. That’s a new one on me. This dish is an easy meal to whip up on a weeknight. All that blogging about nepitella made me hungry and so for dinner tonight, I whipped up this tasty dish with ingredients I had on hand. If you don’t have nepitella, you’re forgiven this time, and can substitute a mixture of basil and mint. 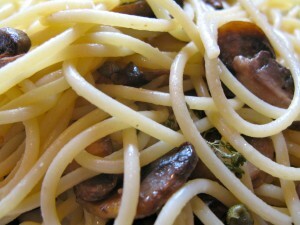 While water is boiling, cook mushrooms in about 2 tablespoons of the olive oil. Sprinkle with nepitella and salt. Half-way through cooking, add the red pepper to the mushrooms. Add the capers too. Cook mushrooms until well done. During the last five minutes, add the garlic (be careful not to burn). And add the nutmeg. Drain the spaghetti and put it back in the empty pot. Add the mushroom mixture and stir. Add about 2 tablespoons of the olive oil and the butter. Sprinkle on the parmesano cheese. Add salt to taste and serve. 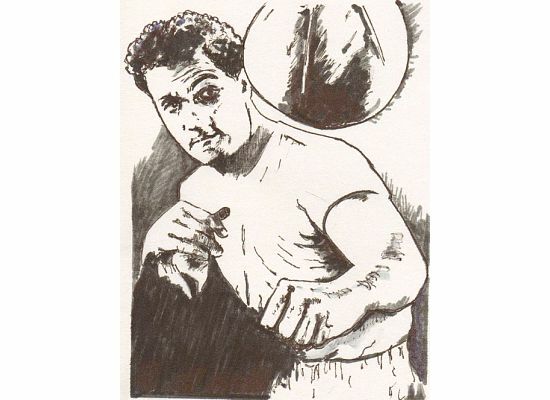 Rocky Marciano, by Andover artist Joe Gemellaro. My friend Joe Gemellaro is one of the most talented artists I know. He has a knack for recreating the human form, especially faces. It is a gift he was born with. Shown here is a study of a portrait Joe drew of Brockton native Rocky Marciano, heavyweight champion of the world from 1952 to 1956. Joe donated prints of the final sketch to several charity groups, including the Haverhill Boys Club which auctioned it off last year to raise money. It’s uncanny, just how right he manages to get the eyes. In another framed portrait, all Joe drew was a single eye. And when you look at it, you instantly recognize Mohammed Ali. To order a print of Rocky or to see more of Joe’s work, contact the artist directly. Good Italian food isn't all about red sauce, as this dish proves. This is a little different, but very good, simple and easy to make. Pellegrino Artusi, in his famous 1891 cookbook, said that some might exclaim, “What a ridiculous dish!” But we both like it. It’s Romagnan and a little sweet. 2 tablespoons sweet almondsThen “strain the powder through a silk strainer” (or whatever) and store it in a glass bottle. It should keep for years with the same potency. Mash walnuts with bread crumbs, and add some confectioners’ sugar and a pinch of spices. 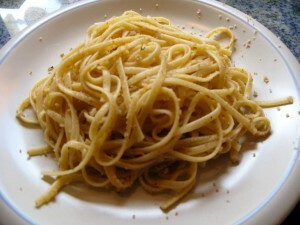 Drain the pasta, season it with oil and pepper, stir in the spices and serve it. William Kelley (right) at his art show in New York City. Click the photo to run the audio-slideshow of "The Tranforming Power of Colour." 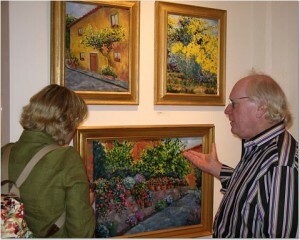 My Irish brother-in-law, William Kelley, paints Tuscan landscapes. For the past ten years he has lived six months in Florence and six months in Sarasota, Florida and I’m ashamed to say he knows more Italian than me. He had a show in New York City this month at the Walter Wickiser Gallery. William (aka Billy) moved to Florence a little more than 10 years ago to further his artistic education at the Lorenzo de’ Medici school. He was in his mid-fifties then and stuck out a little at the school where most students were in their 20s. But Billy is a kid at heart, something that is echoed in the bold choice of color combinations that he uses. See for yourself. 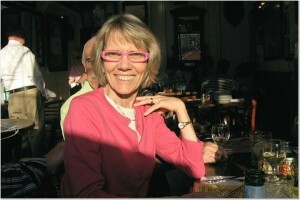 My favorite NY sister-in-law, Marilyn Martucci. That's her husband, Fred, peaking out from behind. 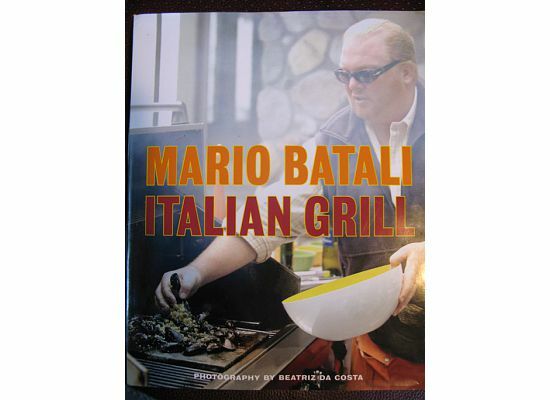 My favorite New York sister-in-law and her husband Fred, gave me this cookbook for my birthday earlier this month: Mario Batali Italian Grill. It’s filled with tantalizing recipes, using basic, simple ingredients put together smartly in the Tuscan way. Batali knows what he’s doing when it comes to Italian cooking, but I have to admit I laughed when I learned he decided early on in his career that he needed to travel to Italy and live there to learn how to make good pasta. My brother and I only had to watch my mother or travel a few miles to Boston to my grandmother’s kitchen. The book contains recipes for antipasti, pizza, fish, meat and vegetables. When I first got the book, I flipped through the large, bright photos and scanned some of the easy, step-by-step instructions. I was itching to make something but the right alignment of good grilling weather and list of ingredients in my cupboard and fridge didn’t match up until this week. While walking through the supermarket, some beautifully thick pork chops caught my eye — and they were on sale — so I bought them and figured out later how I would cook them. 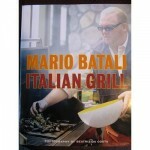 Sure enough Batali had a good grilling recipe for them in this book. And when the sun was shining I was grilling and smiling. This side dish, or first course, cleanses the palette preparing the way for more grilled treats. This recipe from Mario Batali’s Italian Grill cookbook is flavorful with hints of lemon, mint, and salt. The jalapenos may be a little too hot for some, so I recommend serving them as a topping on the side. You can prepare the artichokes early in the day and then throw them on the grill that night. Fill a large pot with 6 cups of water and add the juice of 1 1/2 lemons; add the 3 lemon halves too. Snap off the tough, outer leaves from one artichoke until you come to the leaves that are pale yellow toward the bottom. Cut off the top 1 inch of the leaves. As you work, rub the cut surfaces with the remaining lemon half. Trim off the bottom of the stem, and using a paring knife, trim away the tough outer layer from the stem. Trim any dark green parts from the bottom of the artichoke. Half the artichoke lengthwise and remove the fuzzy choke (either with a grapefruit spoon or paring knife). Pull out the small purple inner leaves. 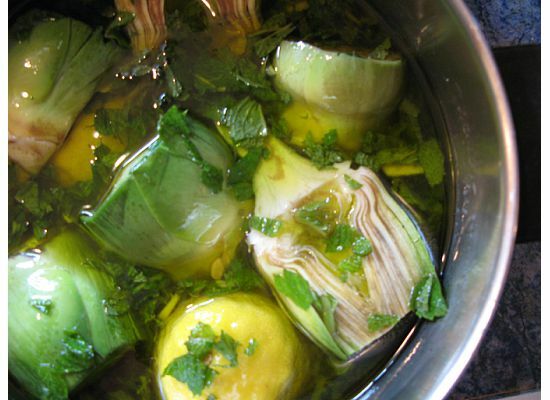 Put the trimmed artichoke in the bowl of lemon water and repeat with all of the artichokes. Add the chopped mint, garlic, olive oil, and wine to the pot. Add more water if needed to cover the artichokes. Cover the pot and bring to a boil over high heat. Reduce the heat, cover, and simmer until just tender, about 15-20 minutes. Drain and allow to cool. Place the artichokes cut side down over the hottest part of the grill and cook, unmoved, for 3 to 5 minutes, until nicely charred. Turn and cook for 5 minutes more, or until golden brown. 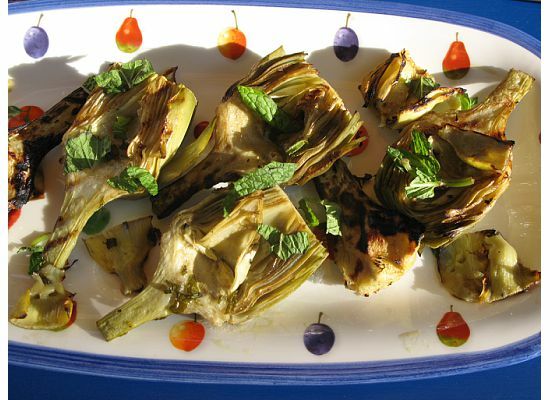 Place artichokes on a platter and top with remaining mint and jalapenos (or serve jalapenos on the side). Serve with a bowl of course salt. OK. Things are really starting to get out of hand. Everywhere you look, products are called Tuscan. It’s as if you slap the label on something and it instantly sells. I’m not sure exactly when this started happening but it was going on long before the book “Under a Tuscan Sun” started selling and was eventually made into a movie. Each year it seems to get crazier and crazier. While driving on Route 93 north near Boston the other day, I saw a billboard for Smirnoff’s Tuscan Lemonade . It claims to be flavored with real Limoncello, but Limoncello comes from southern Italy, not Tuscany. Not even that exaggeration prepared me for the TV commercial I saw last night. They’re now marketing Tuscan food for cats. You heard right: Fancy Feasts is selling a Tuscan recipe line for your feline friend. I have to wonder if in this economy, poor old folks are chasing it down with a Tuscan Lemonade.